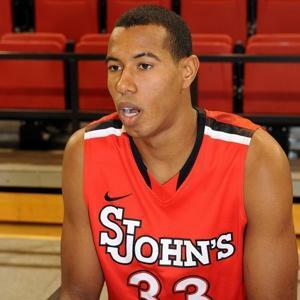 Power Forward Orlando Sanchez (above) of St. John’s. The NCAA tonight ruled in favor of the appeal brought by St. John’s on behalf of Orlando Sanchez, successfully facilitated by high powered eligibility attorney Robert Orr, whom St. John’s had retained to make Sanchez’s latest appeal. Orr had successfully made the case for UCLA’s Shabazz Muhammad, the enormously talented freshman wing player, who had been initially ruled ineligible for the 2012-2013 season, which granted Muhammad his freshman eligibility in November of 2012. Muhammad has gone on to average 18 PPG and 5 RPG, while leading the Bruins to a 21-7 record this season. UCLA is 11-4 in the PAC-12, tied right now for the conference lead with Oregon, and while they are outside the top 25, they are headed to the dance. What made the Shabazz appeal so crucial for UCLA was the probability that, had Shabazz lost his appeal, the player would have most likely sat out this season and then went directly to the NBA. Perhaps Orr’s help in the Sanchez case can have a similar effect on St. John’s next year. The Johnnies have been woefully deficient in the paint this year, and Sanchez, who will be 25 in May, averaged more than 11 RPG and 4 BPG in his last season of JUCO ball. While Lavin has called Sanchez a “shot maker”, we think that was more a function of him being political than being truthful. We see Sanchez as an excellent shot blocker, rebounder, and defender with great length (6’9, 215 lbs.) and maturity, and we expect him to be the starting power forward next season. Sanchez may not be known for his offense, but he is already a man who can fill the lane and open things up for St. John’s in conference play by playing solid defense. This season effectively becomes a red shirt season for Sanchez, who will debut for St. John’s in November of 2013. St. John’s will also have God’s Gift Achiuwa returning to next year’s squad, giving them considerable veteran beef inside for a deep tournament run. While Gift obviously has his flaws, he was a significant contributor for a lot of last season, and makes a very good looking backup four. While the decision to grant Sanchez the year of eligibility does mean that right now, St. John’s has one scholarship too many allotted for next season. Obviously one guy’s got to go, which, with all of the flux surrounding the program in the last 2 years, does not seem far fetched. In our dream scenario, that guy would not be Jakarr Sampson, who we believe would combine with Sanchez and Obepka to form one of the longest and most athletic front lines in the nation. Our dream starting 5 would be rounded out by point guard Jamal Branch and shooting guard and leading scorer D’Angelo Harrison. We would hope that rather than Sampson declaring for the draft, a little to never used player will transfer, in order to accommodate the recruitment of a potential scorer, such as the speculation surrounding Rysheed Jordan. Though Bourgault has made a contribution on the court, we could most easily live with his departure as opposed to guys like Jones and Balamou, who have more eligibility and greater upsides. Even if Samspon declares for the draft, we would think that St. John’s looks extremely good for next year, especially considering they play their best with Obepka on the floor. With Sanchez next to Obepka, St. John’s should control the paint, and Sanchez will probably slide to the 5 when Obepka sits, allowing St. John’s to continue to control the low box with Sanchez and Gift. We’d have suggested Max Hooper as a transfer candidate, and that still may be, although we don’t think it’s likely that Hooper, who transferred from Harvard, would change schools again. We’d also suppose there is a possibility that Amir Garrett, a strong pitching prospect for the Cincinnati Reds, would give up his basketball scholarship to concentrate on baseball. Such a move would also alleviate the scholarship logjam, although we are keen on having Garrett back on the court next season.